Sprains and strains to muscles and joints often happen when we over exert untrained muscles without warming up properly or try to go beyond a joint’s natural flexibility. Sometimes we feel the pain straight away, however some injuries might not cause pain until later on. What can you do? Relative rest: The first thing to do if you feel pain is to reduce the offending activity – pain is usually your body’s way of telling you that there is something wrong that needs your attention. It can be normal to feel a little sore after exercise for a day or two, but if it is more than this, pushing through the pain is rarely beneficial. However, movement stimulates the healing process so stay as mobile as you comfortably can. Try to keep the joint moving through a comfortable range of motion, without forcing it to the point of pain. This will help to encourage blood flow and keep your joint flexible whilst it heals. This is particularly relevant for back pain as gentle exercise, such as walking, can help. You should slowly build your activity levels up as soon as your symptoms begin to resolve and as soon as you are able. 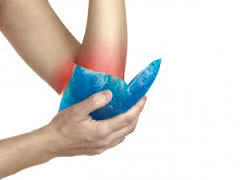 Ice: Cooling the area using an ice pack can help to reduce swelling and pain. Wrap a thin tea towel around the area so as to avoid direct skin contact and then apply the pack to the injured area for 10 – 15minutes. You should repeat this several times per day for the first 72 hours. This will help control inflammation, making it easier for your body to get blood and nutrients to the area and resolve the injured tissues. Compression: Gently applying a compression dressing may help to temporarily support the injured joint and reduce swelling, though remove this immediately if there are signs that this is reducing the circulation to the area (numbness, pins and needles, the skin turning white or blue, etc.). Elevation: If the injury is in the lower limb (knee or ankle), elevating the area a little can make it easier for your body to drain fluids that might accumulate around the area, causing swelling. For example, if you have hurt your knee, sitting down with the knee raised on a low foot stool may ease your pain. Seek medical attention if you have pain that cannot be controlled with painkillers, you cannot weight bear on an injured limb, you experience paralysis or loss of sensation, or if the swelling is very bad. Seek help from your local A & E Department, urgent medical centre or telephone 111 for advice. If the pain or swelling fails to improve within a week, a visit to an osteopath may be beneficial. They will be able to assess the injury, advise you on the correct treatment and can provide some manual therapy which may help it get better faster. The information on this website, including my blog, should not be used as a basis for diagnosis, choice of treatment or choice of medical practitioner. It is intended that the information published here shall enable users to conduct their own research into Zest Health’s services and products. We cannot guarantee that information provided by us through www.west-london-osteopathy.co.uk and my blog will meet your health or medical requirements. If you are concerned about your health, please contact a health professional or contact me on 077594 84655. By using this website, you acknowledge and agree that Zest Health will not be responsible for any claims, losses or damages (whether direct or indirect) arising out of, or relating to the use of, or reliance on the contents of my website www.west-london-osteopathy.co.uk and blog except to the extent that such liability cannot be excluded by law. Providing Osteopathy in Ealing, West London and Weston Turville, Aylesbury.